Half of Manila was under water and 2,50,000 people fled their homes today as torrential rain paralysed the city, sweeping away houses, stranding residents on rooftops. Syrian rebels trying to fight off an army offensive in Aleppo said on Tuesday they were running low on ammunition as President Bashar al-Assad's forces encircled their stronghold. A Taliban bomb killed eight persons and wounded five today when it struck a minibus in Kabul, the police said, amid growing unrest in areas neighbouring the Afghan capital. NATO's International Security Assistance Force, which has 130,000 US-led troops in Afghanistan, has also noted a spike in attacks countrywide in recent months, since the start of the insurgents' annual summer offensive. Gunmen killed 16 persons when they fired on worshippers at a church in Nigeria's central Kogi state during a Monday evening service, the police said on Tuesday. Half of Manila was under water and 2,50,000 people fled their homes today as torrential rain paralysed the city, sweeping away houses, stranding residents on rooftops and triggering a landslide. At least 15 persons were confirmed dead as the sprawling metropolis and nearby provinces suffered the most extensive floods since a typhoon that killed hundreds three years ago. Schools, financial markets and most government and private offices were shut as key roadways in the capital, a city of some 15 million (1.5 crore) people, were submerged by waters that in some areas reached neck-deep. "If we put it in a percentage, at least 50 per cent of Metro Manila is flooded," Gine Nievarez from the state weather service told AFP. As local television flashed live footage of rampaging rivers carrying off houses and residents marooned on the roofs of their homes, President Benigno Aquino said the government was doing everything it could to help. Bad weather from seasonal southwest monsoons has been pounding Manila and nearby areas for over a week. 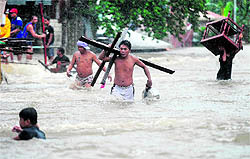 Meteorologists said the crisis in the capital came as over half a month's rain fell on the city in 24 hours. The National Disaster Risk Reduction and Management Council said that more than 8,00,000 people had been affected, with 18,600 in government evacuation centres and some 2,31,000 seeking refuge with friends or relatives. Syrian rebels trying to fight off an army offensive in Aleppo said on Tuesday they were running low on ammunition as President Bashar al-Assad's forces encircled their stronghold at the southern entrance to the country's biggest city. Assad, dealt another political blow on Monday with the defection of his prime minister, has reinforced his troops in preparation for an assault to recapture rebel-held districts of Aleppo after repelling fighters from most of Damascus. "The Syrian army is trying to encircle us from two sides of Salaheddine," said Sheikh Tawfiq, one of the rebel commanders, referring to the southwestern neighbourhood which has seen heavy fighting over the last week. 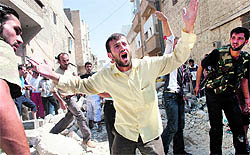 Mortar fire and tank shells exploded across the district early on Tuesday, forcing rebel fighters to take cover in crumbling buildings and rubble-strewn alleyways. Tanks have entered parts of Salaheddine and army snipers, using the cover of heavy bombardment, deployed on rooftops, hindering rebel movements. Another rebel commander, Abu Ali, said snipers at the main Saleheddine roundabout were preventing the rebels from bringing in reinforcements and supplies. He said five of his fighters were killed on Monday and 20 wounded. But rebels said they were still holding the main streets of Salaheddine which have been the frontline of their clashes with Assad's forces. A fighter jet pounded targets in the eastern districts of Aleppo and artillery shelling could be heard in the early morning, an activist in Aleppo said. 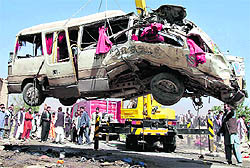 A Taliban bomb killed eight persons and wounded five today when it struck a minibus in Kabul, the police said, amid growing unrest in areas neighbouring the Afghan capital. NATO's International Security Assistance Force, which has 130,000 US-led troops in Afghanistan, has also noted a spike in attacks countrywide in recent months, since the start of the insurgents' annual summer offensive. June saw the highest number of attacks in nearly two years, with more than 100 assaults a day across the country, including firefights and roadside bombings, the coalition said. "A remote-controlled mine struck a civilian minibus in Paghman district around 5:00 am today, killing eight people and injuring five," Kabul police chief General Ayoub Salangi told AFP. The man who set off the bomb had been captured with the cooperation of local residents, Salangi said, describing him as a member of the hardline Islamist Taliban waging an insurgency against the Afghan government. All the dead were men, he said, apparently on their way to work in what is a usually peaceful area on the western outskirts of the city. "A group of three unidentified gunmen stormed the Deeper Life Church in Okene and opened fire on them, killing 16," Simeon Ille, spokesman for the Kogi state police, told Reuters by phone. A witness, who asked not to be identified for fear of being targeted, said around 10 gunmen blocked off the exits to the church before shooting the trapped people inside. Ille said security forces last month prevented a suspected suicide bomber from detonating an explosive at a different church in Okene, a town around 225 km south of the capital Abuja. The suspected would-be bomber fled, he said. Islamist sect Boko Haram has attacked several churches this year in Nigeria but Monday's attack was further south than the group's usual targets. In February, Boko Haram claimed a prison break in Kogi state when 119 prisoners were freed. The sect has carried out jail raids before and one of its key demands is the release of its imprisoned members.